Bobby Burns (471). Photo courtesy of Mick Jenkins. 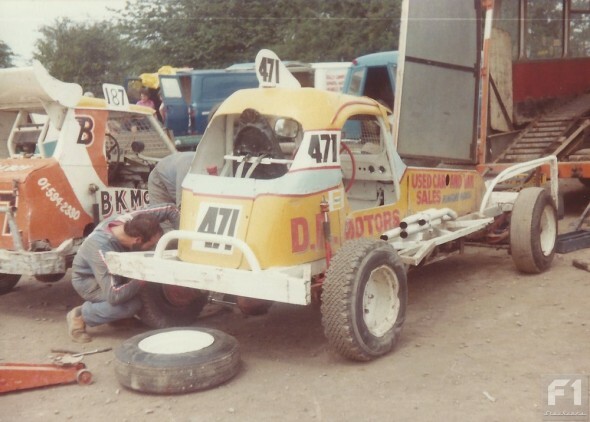 Initially a banger racing driver at the tracks close to his Essex home, Bobby Burns transferred to BriSCA F1 in the seventies. A few test appearances from 1973 to 1975 didn’t amount to much, but Burns took the decision to concentrate solely on F1 at the end of the decade, racing with his banger team-mate, Richie Ahern. Inevitably a regular at Northampton and Coventry, Burns also put in the miles on the road and travelled to Sheffield, Bradford and the north-west. He quickly became known for his hard racing style and ability to use the bumper to put his opponents through the fence. Drivers quickly learned to be wary when they saw car 471 in their mirrors – or even on the centre green, as Nigel Whorton once discovered! In 1982, Burns’ friend and racing compatriot, Richie Ahern, suffered major injury after a concussion in a racing incident left him in a wheelchair. Richie died of complications the following year, and it was fitting that Burns became the second winner of the Richie Ahern Memorial Trophy at Belle Vue in 1984. In the mid-eighties, Burns became a solid red top driver and often climbed to superstar. Burns must rank as one of the best drivers never to have worn the gold or silver roof. He came close to both – finishing second in the National Points Championship to a dominant John Lund in 1990, and the same driver also beat him in the 1992 World Final at Bradford. A minor stroke while on holiday ended Bobby’s racing career in 1994. The fans on the terraces were disappointed. His fellow drivers no doubt breathed a sigh of relief.